MEDITERRANEAN AGRICULTURAL SCIENCES is a refereed scientific journal published by the Akdeniz University Faculty of Agriculture. The journal aims to share the knowledge at national and international levels by publishing researches in agriculture and life sciences in Turkish and English languages. The journal primarily publishes original research articles and accepts limited number of invited reviews in the areas of agricultural biotechnology, agricultural economics, agricultural machinery, animal husbandry, bioenergy, biostatistics and genetics, farm structure and irrigation, field crops, food science and technology, horticulture, landscape and nature conservation, natural resources, plant protection, and soil science and plant nutrition. MEDITERRANEAN AGRICULTURAL SCIENCES is an Open Access Journal and published online three times per year in April, August and December. The manuscript submitted to the journal is subject to preliminary assessment by the editorial board. The board has the right to decline the manuscript without initiating the peer review process in the event the manuscript does not meet the journal’s criteria. Manuscripts that meet the basic requirements of the journal are sent to three referees for review by experts in the particular field of science. The journal does not charge any article submission or processing charges. 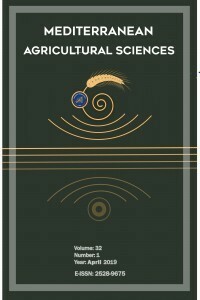 MEDITERRANEAN AGRICULTURAL SCIENCES is a continuation of the former “The Akdeniz University Journal of the Faculty of Agriculture (ISSN 1301-2215)” which has been published regularly since 1988. The copyrights of published articles in the MEDITERRANEAN AGRICULTURAL SCIENCES belong to the Akdeniz University Faculty of Agriculture. Mediterranean Agricultural Sciences is licensed under a Creative Commons Attribution-NonCommercial-NoDerivatives 4.0 International License.